SACRAMENTO, Calif. (CN) – California is on the verge of creating a first-of-its-kind safety net for marijuana retailers to deposit cash gleaned from legal pot sales. The proposal, Senate Bill 930, calls for the creation of state-chartered banks and credit unions that would cater solely to licensed cannabis businesses. Supporters say the pot bank will bring the six-month-old recreational pot industry “out of the shadows” by allowing businesses to pay their state taxes without toting briefcases full of cash. Fiona Ma of the State Board of Equalization says current framework doesn’t allow the state to accurately track and collect pot taxes. According to the state, California consumers bought nearly $340 million worth of marijuana in the first two months of legalization. State officials estimate that the industry could generate up to $20 billion in revenue by 2020. “We cannot audit cash, so we need to figure how to work with the federal government or around the federal government,” Ma told the Assembly Business and Professions Committee on Tuesday. Since voters legalized recreational marijuana in November 2016, California lawmakers and regulators have been discussing ways to bring legitimate pot businesses into banks. With no federal protections, major banks like Wells Fargo will not accept cash generated from the federally classified Schedule I drug in the nine states that have voted to legalize recreational marijuana. Backers claim SB 930 would fix the problem in California. “The current [cash-only] system is not sustainable, so we need to do something different,” said Assemblyman Kevin McCarty, D-Sacramento. After a brief discussion, McCarty and professions committee members passed the bill 13-2. The measure by Southern California Democratic state Sen. Bob Hertzberg has already been approved by the state Senate and advances to an Assembly fiscal committee. Despite the overwhelming support, committee members agreed the measure has some inherent flaws. While cannabis businesses would be able to finally stash their cash safely, they would be limited on how they can spend or withdraw it. The deposits could only be used to pay taxes, rent, licensing fees and vendor expenses. 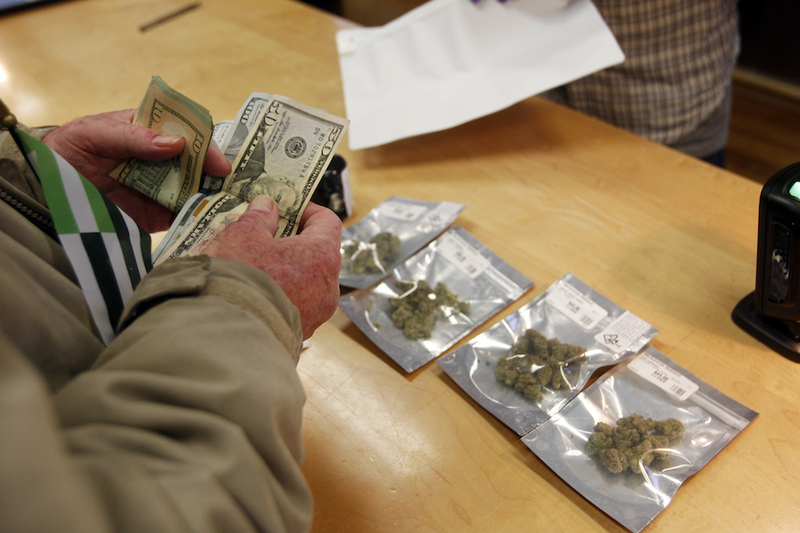 Pot bank customers could also purchase state bonds with the deposits. But only state and local agencies would be required to accept the pot-bank checks; landlords and private businesses could simply refuse. “I’m very sympathetic to trying to solve the problem that these businesses are facing, but I’m struggling to understand how this moves us all the way to where we need to be,” said Republican Assemblyman Jay Obernolte. The former mayor of Big Bear Lake cast SB 930 as a “half-measure” but said it was a step in the right direction. Obernolte eventually voted in favor of the proposal. Cannabis industry groups and representatives from cities like Sacramento and San Francisco testified in support of the bill. No groups testified in opposition Tuesday. The state tax board says if California creates the nation’s first pot bank, it could spark a nationwide trend.